BARCELONA, Spain -- Standing in line for a voice assistant at a mock hotel room, visitors curiously watched how their water was being delivered after the order was given in a slew of different languages. Immediately after the order was put to the voice assistant, cute, white robots began the journey with their autonomous mechanism. After putting a bottle of mineral water in its case, the robot brought the ordered item to the doorstep. Displayed at the world’s biggest Mobile World Congress 2019 this week in Barcelona, the scene offered visitors a chance to look into how the next generation of wireless network can transform lifestyles. 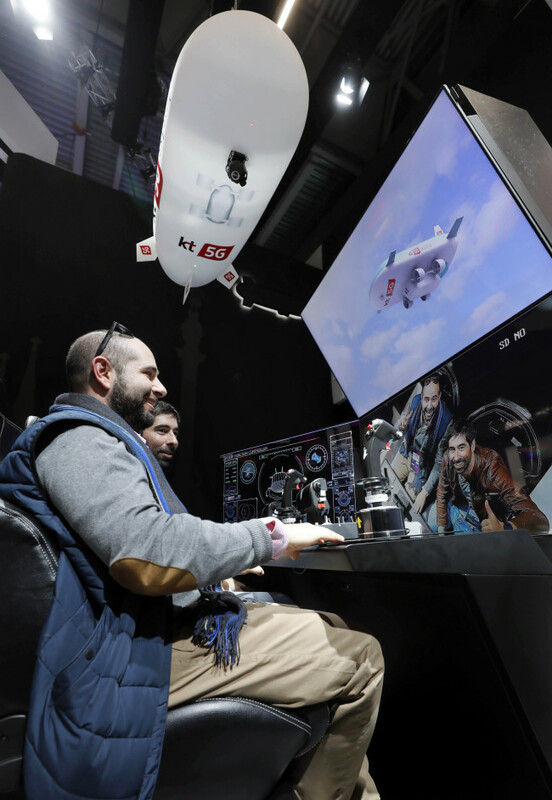 The futuristic scene is just one of the technologies South Korean telecom giant KT showcased during MWC 2019, where some 2,500 companies from around the world gathered to present technologies powered by the fifth-generation network. 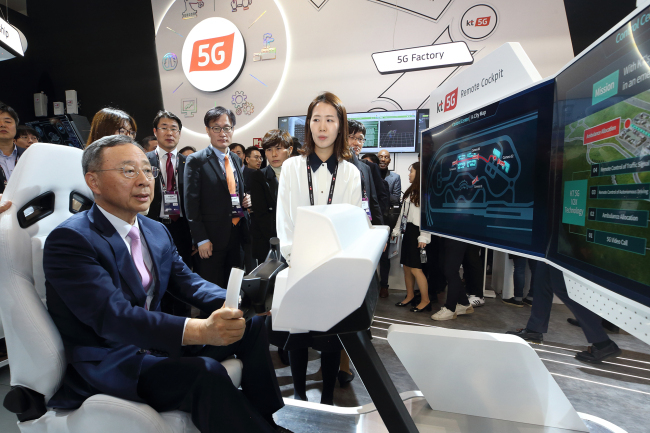 South Korea is poised to take the lead to kick off full-fledged 5G service with smartphones using the technology hitting the market next month. After introducing a trial version of 5G during the 2018 PyeongChang Winter Olympics for the first time since the company envisioned the idea in 2014, KT pledged to come up with more applicable network services, as users are still not fully grasping the actual changes the new network would bring. 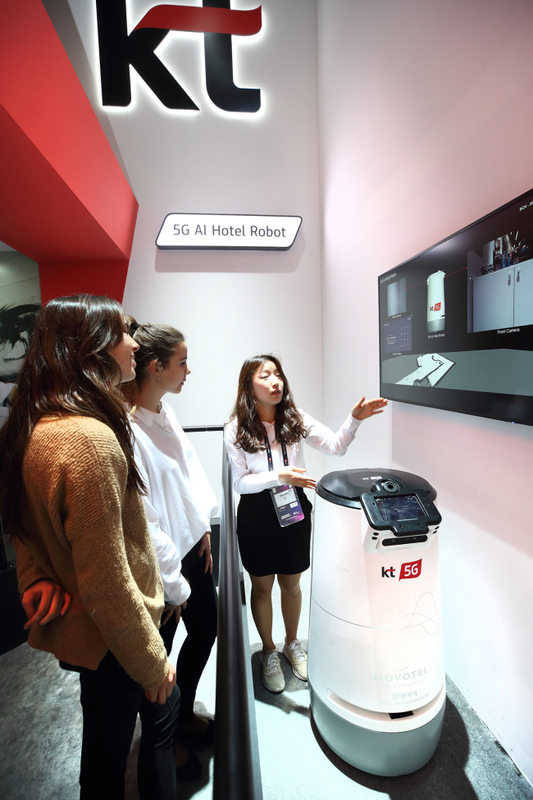 “The 5G’s massive connectivity will ensure distribution of benefits from the ‘fourth industrial revolution’ to all industries and all individuals fairly and economically,” said KT Chairman Hwang Chang-gyu during his keynote speech for MWC 2019. Without specific pricing plans for consumers, the benefit of 5G technology is likely to be best appreciated among businesses first to improve productivity and reduce safety risks. Case in point are the smart factories run by cloud computing systems. Capitalizing on massive data collected via the 5G network, connected robots can carry out manufacturing process without peripheral support machines. Such smart factories have already been in place at a shipyard located in the southern port city of Ulsan. The system is being used to simplify work while ensuring the safety of workers. The 5G technology can also be applied for humanitarian purposes such as rescuing people from car accidents and natural disasters. At the MWC, located right next to connected robots were cockpits in which visitors could sit in the driver’s seat and experience helping people in danger. The 5G-powered machine help people find the fastest route by informing them of traffic situation in real time. KT also showcased a platform where users could monitor from halfway around the world. Using a high-tech camera attached to a blimp, or “Skyship,” users could see real-time images sent from Haeundae beach in Busan, located about 10,000 kilometers away from Barcelona. Faster commercial rollout than global players? While some of the platforms had been introduced before being showcased by KT at MWC, the South Korean prototype products are expected to hit the market faster than those developed by global players. According to KT officials, the company’s concept of operating hotels with voice assistants could be similar to Amazon’s Alexa platforms, but their commercial rollout will be much faster than global heavyweights. There are already four hotels in Seoul that have adopted 5G-powered services to cater to visitors. Among them are premium hotel chains such as Western Chosun Hotel and Novotel Ambassador Seoul Dongdaemun. “It seems that the way we are using hotel services is pretty much the same as we did 10 years ago,” KT Vice President Im Chae-hwan, who manages the AI business unit and marketing group, told The Korea Herald. “Voice assistants and robots will be able to reduce the number of staff dramatically. By investing about 30,000 won ($27) per month, they are able to run the hotels efficiently to the extent they can afford the holiday surge,” Im said. There is another area where 5G-powered service can be applied for everyday use: unmanned baristas. Based on the hyper-speed network, the platform can discern consumers’ taste and provide them with tailored services. According to KT officials, its unmanned barista service is available at 40 coffee shops, and the number is expected to increase next month. Most will be deployed to office buildings or at street vending machines.